It’s amazing how people can let you down. I despise feeling dissapointed. I have come to realise that people ask you to be upfront with them, or honest, but then when you are, they just cannot handle it. I’m by no means an easy person. I feel very strongly about certain things and would not waver for any reason. I believe in consistency, be false or be true, but for heaven’s sake just be consistent. I see it as a great weakness when people are so influence d by the opinions other people have of them, to the point where they change their mind all the time to accomodate the people they want to be liked by. Seriously?? Why?? Would you rather have a false person in your group of associates or someone you could truly rely on. I have always said that trust is a very fragile thing. In my opinion it is just not realistic to trust everyone at first sight. I always enter relationships with a degree of mistrust. 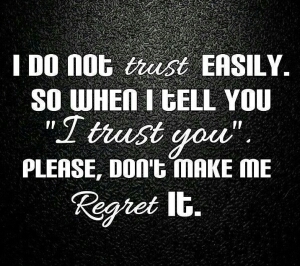 I think trust is proven and earned. Sigh, I might have trust issues, but I know that the people who confide in me do so knowing whatever secret they shared would be safe. I was recently reminded that even when you think you can trust someone, it is not always the case. Sometimes you should not have to remind people that you are saying things in confidence. Sometimes you should be able to vent and give your opnion without it being discussed with a group of people. Sometimes you don’t speak to the “correct ” people because your intentions were merely to vent, not to complain. Sigh, it sadens me to know that the few people I started to see as trustworthy, went and shared my thoughts and turned it into endless discussions. I might be a difficult person, I might not show emotion and go around and hug everyone and cry for every sad situation, but that does not mean I do not feel emotional, it does not mean I don’t want to cry. When I feel hurt, I feel wounded as having gone through a emense battle, when I cry it is because I feel deeply hurt. My emotions may not show because when they do they are meant, they are sincere, they are painfull. Very difficult when people betray you like that, especially when you’re someone who tends to hold in your emotions and don’t vent often. I hope you’re feeling a little better than you were when you wrote this.